Before I start making your custom order we will discuss one on one what you want. I will use my expertise to ensure your combination of patterns, clay, and glaze, work well together chemically and aesthetically. Please look over the steps below and fill out the information in the forms for your desired order; either the lace plates, or the floral works. I will contact you to go over details and specifics as soon as possible. Because each item is hand made, note that custom orders can take 6-8 weeks or more to complete depending on the size, intricacy, or number of items desired.Additionally, the prices of custom order items may be elevated due to the unique nature of each order. 1. Choose a Clay: We offer two types of clay to choose from, a Hazelnut Brown and White Stoneware. *Note: if you choose Hazelnut, the only glaze available is Satin White. Other glazes may be added in the future for the brown clay. Hazelnut Stoneware clay on Left, White Stoneware Clay on Right. 2. Choose a plate shape:Circle or Square. *Note that the rim of the square linear lace plate .5 inches thicker that the full lace square plate. if you desire a thicker rim for the other patterns please note that. 3. Choose a lace pattern:We have a single line of lace or full lace pattern to choose from. You may mix and match these patterns on different plates. *Note: Other patterns may be added in subsequent series of plates. If you would like a custom pattern from our own lace to be used please note that. We can discuss the lace and pattern and see what would be best for your order. 4. Choose a size or set:You may choose a whole set or mix and match sizes. Sizes for the Square and Circle Full lace plates:4.25 inch butter plate, a 5.5 inch bread plate, an 6.75 inch dessert plate, a 8 inch salad plate, and a 9.5 inch entrée plate. 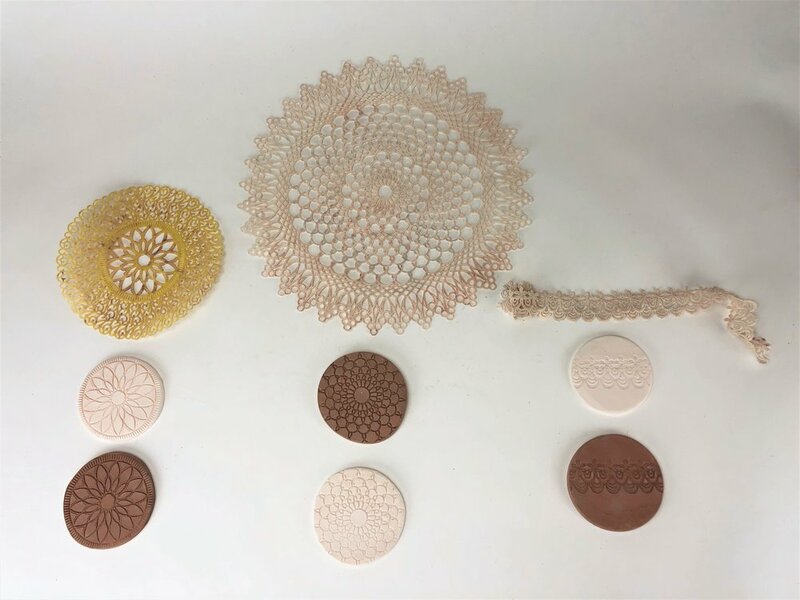 Sizes for the Square Line Lace Plate: 5 inch butter/ bread plate, a 6.5 inch dessert plate, an 8 inch salad plate, a 9.5 inch dinner plate, and an 11 inch large platter or entrée plate. 5. Choose a glaze:For the white stoneware clay you have the choice of a Celadon or an Oribe Green. For the Hazelnut Brown the Satin White is the only available glaze at the moment. *Note: Other glazes may be added for future lines of plates. All items are hand made to order. There may be small imperfections or differences attributed to the hand made quality of the works. How many plates would you like? Please note the sizes you would like in the box below. Please note anything else you think we should know. Are the plates for you or someone else? Are they for a special occasion? Or if ordering multiple combinations of glazes, sizes, or patterns, please note here. When do you need the plates? For floral items, most of these are one of a kind. But if you see a particular flower, or theme that I have done, and you would like something similar, I can do that for you. Also if there’s a particular flower that you want that I haven’t done in the past, I will work with you to create a piece where I do use that flower. Please fill out the form below and give a detailed description of your order in the message box. What shape or type of form would you like? What size do you want your vessel to be. Give us an approximate Length, Width, and Height. By when do you need the vessel? Please allow 6-8 weeks for making and delivery. Is there anything else we need to know? Add any other details you think would be helpful!